Boeing calls them ecoDemonstrators, test airplanes equipped with new technologies looking for ways to make flying more environmentally friendly. 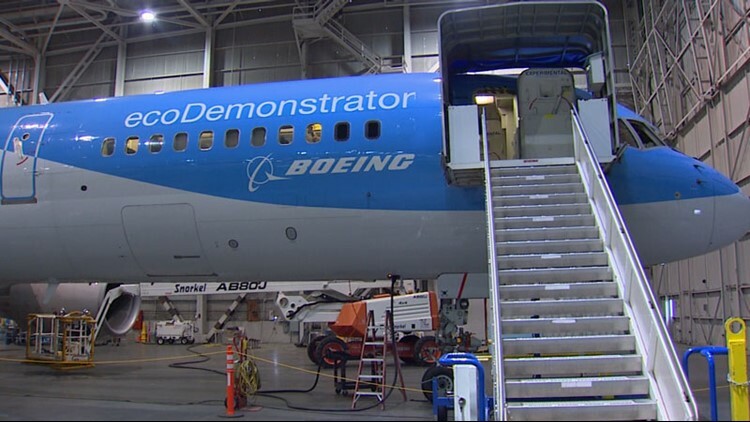 Many technologies tested on board Boeing's ecoDemonstrator program focus on making fuel more efficient and environmentally friendly and flying safer. Boeing’s ecoDemonstrator program was developed to accelerate research into new technologies by packaging multiple research projects onto a single airplane, which serves as a flying testbed over the course of several months. Many, if not most, of the technologies focus on the environment by making the airplane more fuel efficient, quieter, and in one case, even recyclable. Many technologies also involve making flying safer. The program has Boeing working with partner airlines and, in one case, another aircraft builder. On board are technologies developed by Boeing, other aerospace companies and agencies such as NASA and the FAA to test ideas under contract. The First ecoDemonstrator program flew in 2012 - a brand new 737-800 for American Airlines with 15 technologies on board. The second “ecoD” came two years later in 2014, one of Boeing’s own 787 Dreamliner test airplanes with 25 technologies on board. The third in 2015 used a retired 757, which was ultimately recycled. But before it was turned into new aircraft aluminum, the airliner tested another 15 technologies. That year Boeing partnered with Europe’s TUI Group, which repainted the jet in its own colors. TUI Group calls itself a tourism company; in addition to airlines, it also owns travel agencies, hotels, cruise ships, and even retail stores. In 2016, the ecoDemonstrator wasn’t a Boeing jet; it was a regional jet from Brazil, an Embraer E170, with the flights flown inside Brazil. Now, the biggest test program comes on the biggest jet used so far, a Boeing 777 Freighter belonging to FedEx Express. In this case, it's testing more than 35 technologies, which includes satellite-directed flight procedures to get airplanes in and out of airports more efficiently while burning less fuel. What about next year in 2019? All Boeing will say so far is that it will again use a 787 Dreamliner, and the number of tests could well grow higher. So far, the company has tested 78 technologies. About a third of them have been adopted and are being used, or will soon be used, aboard airliners. About a third are still in development, and a third hold little promise. Some of the highlights include flying the world’s biggest engines aboard the FedEx 77 on100% biofuel. The 777 also performed early tests of a warning technology to avoid collisions on the ground and conflicts with drones in the air. A new lightweight thrust reverser, which allows a plane to slow down on landing by changing the direction of engine thrust on landing, is made partly of thermal plastics to save weight. The 757 tested multiple ways to improve airflow over the wings and past the vertical tail and rudder. The tail test, performed under NASA’s Environmental Responsible Aviation Project, was trying to verify wind tunnel tests to increase the efficiency of the plane’s rudder by 17 percent. Another NASA technology tested coatings on the leading edge of the wing to make smashed insects slide off, reducing drag which decreases fuel efficiency. In Brazil, the E170 was used to test an icephobic paint. The buildup of ice on a plane's wing can lead to disaster. The 2014 Dreamliner tests have already led to cockpit touch screen technology which will be installed on the new Boeing 777X, the first which should be flying in about six months. Three 2017 737 flights tested new ways to make engines quieter, along with onboard hydrogen fuel cells, which would generate much of the non-critical electricity on the plane used for things like cabin lighting and entertainment systems. Both are still in development.